When: Saturday 3rd November 2018 - 10:00 pm - 3:00 am. Where: Tramshed Cardiff, Clare Road, Cardiff CF11 6QP, United Kingdom. 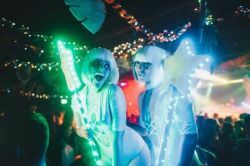 The World's most magical club night transforms one of #Cardiff's most famous indoor venues into an enchanted forest for a night of immersive raving..
* Headline DJs + Live Acts. * Immersive Themed Décor + Props. * L.E.D & Pyrotechnic Displays. * C02 + Confetti Cannons. * Strictly 18+ Entry Policy. Artist / Speaker: Artful Dodger.